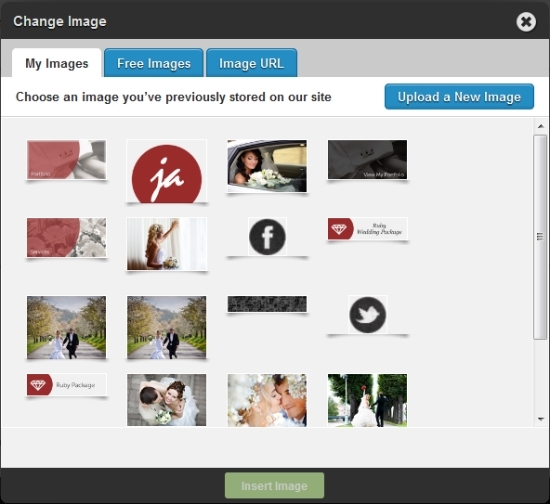 You can add images to a page using the image module or the image & text module. You can also create Slideshows using the Webs SiteBuilder. Click through each topic for more information on how to add images to your website, as well as helpful tips on protecting and managing your images. Step 1: Add the image module by selecting it from the dock at the bottom of the Builder under the General tab and dragging it into place on your page. Step 2: Once the module is in place, double-click the placeholder to add your image. Step 4: Once you’ve selected your image, click Insert Image. The editor is intuitive enough to maintain the correct aspect ratio so that an image is never stretched out of proportion. To place an image on the same line as text, or wrap text around an image, use the image & text module. The formatting options for the image & text module are the same as when working with the image module and text module separately. Click the text portion to launch the formatting toolbar for text. Click the image portion to launch the formatting toolbar for an image. The image will default to the right of your text but you can use the alignment buttons in the formatting toolbar to align the image to the left or the center. As you resize your image using the handles, the text portion will adjust to fit accordingly. How do I delete an image file? In the Builder, double-click the image you wish to delete. In the "Change Image" popover, click the My Images tab and select the image you want to replace the current image with. If you do not wish to replace the image simply delete the module. In the "Change Image" popover, click the My Images tab. Hover over the image thumbnail you wish to delete until a red x appears in the lower right corner. Click the x and confirm your choice to delete. This will delete the image from your page as well as from your File Picker. How do I remove the default border from images? When working with the image module, click the frame picker in the formatting toolbar and click the no border icon. How do I make an image enlarge when it's clicked on? Use the image module to add an image to your page. Click Link to open the "Change Link" pop-up. Click the lightbox tab and check "Enable Lightbox." You also have the option of entering a caption. To place an image on the same line as a text, or wrap text around an image, use the image & text module. The formatting options for the image & text module are the same as when working with the image module and text module separately. The content that you add to your website is your creative, personal, professional property and responsibility. There is no definitive way to protect everything you choose to publish online, but there are some steps you can take to make it more difficult for your content to be re-used. Click here more information.